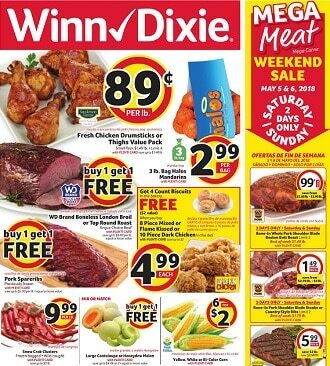 Here is the current Winn Dixie Weekly Ad Sale, valid April 17 – April 23, 2019. Save with this week Winn Dixie Ad Specials, grocery coupons, bakery & deli offers and Buy One get One Free Deals. What you can buy from this retailer supermarkets? All that you need for those fantastic meals and more – Angus Choice beef, Cold water lobster tails, blueberries, Jimmy Dean bacon, Sanderson Farms chicken, DiGiorno rising crust pizza, General Mills cereals, Ragu pasta sauce, tomatoes, Navel oranges, Gourmet cookies, Catfish fillets, Coca-Cola products, cat & dog food.